For and from Emily: Vegetarian goodness. Our friend Emily, mentioned here many times (the queen of salad, our vegetarian friend, etc) gave us a Vegetarian cookbook for Christmas 2009. The cookbook will come in handy this summer, as Gardner and I have decided to be vegetarians for one whole month…the month is to-be-determined – more on this later. Thumbing through the cookbook, we found this simple recipe, which we adapted to suit our needs/local grocery stores/budget. 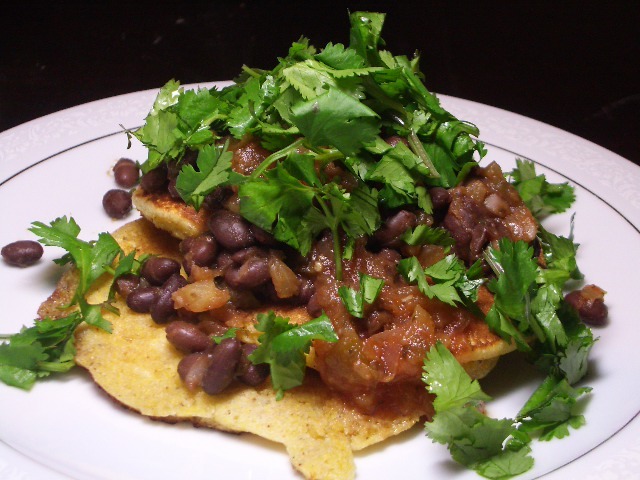 It is surprisingly good – the combination of black beans and cilantro and salsa is hard to beat, and the corn cakes are pretty darn tasty, too. We can count the number of vegetarians we know well on one hand. Are you vegetarian? We have a growing number of vegetarian dinners on our website and promise to have more soon. Enjoy! I’m really excited about more vegetarian dishes – we don’t eat much meat here and pasta is getting old! This looks great!!! Can’t wait to try it! Bob has tons of yummy recipes for you to try during your month of adventure. Just let us know once you decide on the date.